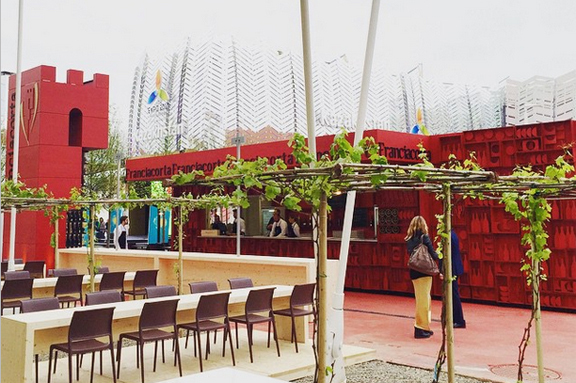 The World’s Fair (EXPO Milano) is here and Franciacorta is THERE! Click here to download the Franciacorta Consortium’s Official World’s Fair (EXPO) press release to read about the Franciacorta participation and all of the various Franciacorta partnerships during the fair. Above: The Franciacorta Wine Bar on the “Decumano,” the fair’s “main street,” which is 1.5 kilometers in length. Today is May 1 and that means that the World’s Fair, EXPO Milano, is here! This year’s theme is “Feeding the Planet, Energy for Life” and Franciacorta is the official wine of the event, which runs through the end of October. Franciacorta will be present in many capacities, including official toasts (and you can read about all of the Franciacorta participation and partnerships here). And if you’re spending any time in Milan proper during your visit to the fair, be sure to stop by the weekly Tuesday Franciacorta tastings at the Fratelli Rossetti shop on Via Montenapoleone (at the corner of Corso Matteotti). Every Tuesday night, an Italian Sommelier Association sommelier will be pouring and speaking about Franciacorta, presenting different wines each week. This program runs through the end of October and the tastings are free. Stay tuned for EXPO coverage. There are lots of EXPO events that are happening in and outside the fairgrounds, including events in Franciacorta. We’ll be posting about them regularly and hopefully Franciacorta, the Real Story will make a visit to the fair next month. In the meantime, you can always find out more on the newly launched English-language version of the Franciacorta Consortium website (scroll down to find EXPO info). And for general information and news about the fair, visit the official site.